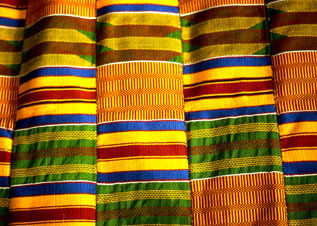 The kente cloth is particularly associated with Akan culture. 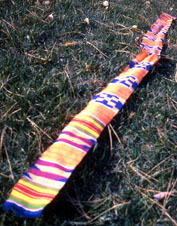 It is made by weaving long strips of coloured cloth into stylized designs, then sewing the strips together. The cloth is worn typically over the left shoulder (over the right shoulder by a few) rather like a toga. A high quality cloth may cost as much as 2 to 4,000 dollars. 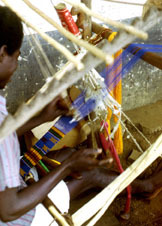 Kente weaving is particularly associated with men, and is seen as men's work. Compare these photos with some from a century earlier. Basel. Although commercial dyes are now used, the deep blue was originally made of indigo, a little plant in the rain forest. 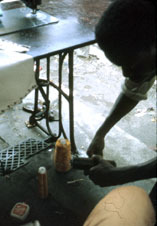 .. At one time the dye was sent north to the historical trading and university town of Timbuktu in Mali. .. At that time, in the Middle ages, Europeans heard of Timbuktu as the end of the world. .. The dye was so expensive by the time it reached Europe that it was used only by royalty, to colour the robes of kings in royal purple. .. As the big hard woods are cut and sold, little plants like the indigo can no longer survive. 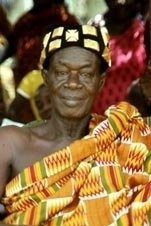 The Mpraesohene (Chief of Mpraeso) is seen here during an afahye (festival) wearing kente cloth. It is worn like a toga over the left shoulder. 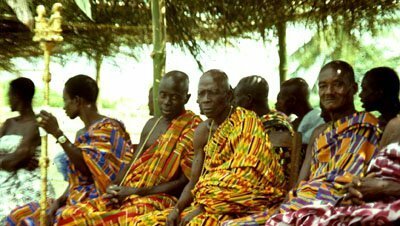 When a woman is in the role of an elder, she wears the kente in the same manner as a man. 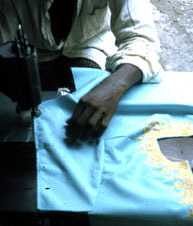 Although sewing for women's clothing is usually done by seamstresses, and that change is attributed to the influence of missionaries in the nineteenth century, the embroidery is still usually done by men. Seamstresses will cut and partially sew a dress, for example, then send it to an embroidery tailor to add the decoration. 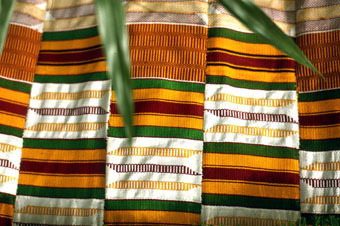 After independence in 1957, the jolomy (jeremi) smock became popular in Ghana. Popular songs were written about it. It was usually made of cotton or synthetic cloth, originally of plain colours, later of tie dye or of colourfully printed cloth. 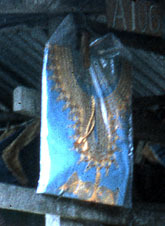 The embroidery was put onto the neck, short sleeves, and waist. More recently, Nelson Mandela of South African fame is seen to wear the jolomy style daily. In the USA it sometimes was called the "dashiki." 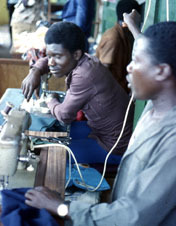 These slides show the making and embroidering of jolomy by Kwawu tailors. 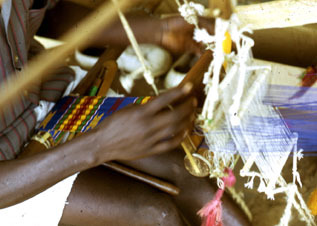 While weaving and embroidery is usually seen as the work of men, retail selling of cloth is mainly done by women. 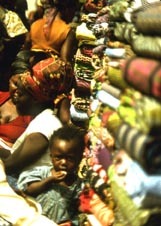 There are a few cloth factories in Tema, but most cloth is imported. Importing cloth wholesale is done by wealthy business men and business women who have the necessary capital. They then resell it to retailers, some in stores, others being independent women who sell in small quantities on the street or in markets. As explained in Women I, retail marketing, especially of food, is seen mainly as work for women. 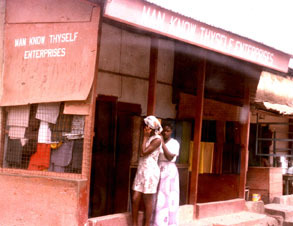 An interesting occupation, often by civil servants and other office workers to add to their small incomes, is done by women, selling cloth to fellow workers. 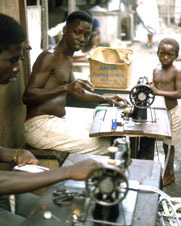 In the late nineteenth century, the Basel missionaries introduced sewing for girls. Their intentions were to train them to be dutiful housewives, but they did not reckon on the traditional independence of women and their propensity for setting up their own businesses. 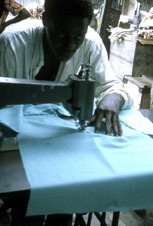 Women skilled as seamstresses set up private schools and seamstress services. This meant they encroached on the traditionally male occupation of weaving, yet retained traditional female access to independence and income. See Covert Gynocracy.